Displays the photo gallery for a selected Gallery Album. It was a bone chilling day on Crystal Mountain Resort’s “The King,” with winds dipping the temperature well below 0-degrees Fahrenheit. The ascent to the top of venue was a challenge in itself, and then it was time to not only drop into the intimidating face. It was time to compete—there was a podium on the line. 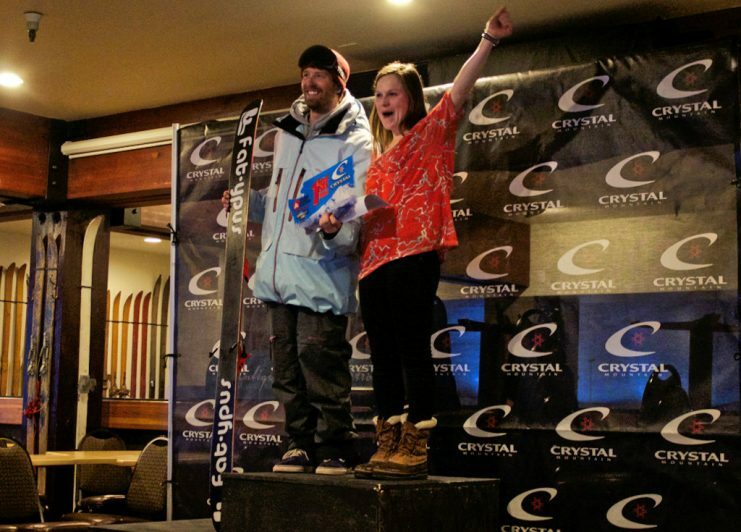 It was February 4th and 5th, and Crystal is hosting a Freeride World Qualifier competition. Day one was held on Northway Peak, while today competitors battled on the King’s steeps and drops. With below average temperatures and below average snow conditions, the athlete’s skills, agility and mental preparation were truly tested. Composure and an ability to stay on their feet had a chance of podium time. The ones who can’t…well, consequences are high on the Freeride World Tour, especially at Crystal. Charging her line and showing no fear, Kylie Sivel shocked onlookers with her aggressive and technically skiing ability. Upon dropping in, the question on everyone’s tongues was, “Is that a guy or a girl?” Once her pink pants became apparent, there was no doubt she would be on podium with her aggressive, technical and stellar line choice. Sean Richard took home the gold for men choosing a peppery and difficult line, searching the face for air time as possible. Colby Vavolotis earned silver and Randy Evans snagged bronze. The Freeride World Qualifying events have a ranking system that gives points according to what place the athlete earns and depending on how many stars the venue is rated. Crystal Mountain happens to be a four star venue, allowing the skiers to earn as much points as possible without competing on the Freeride World Tour. First place receives 1,800 points, second place earns 1,450 points, third earns 1,200 points and so on. With multiple qualifiers around the world in the season starting in May of 2013 and ending in April of 2014, the athletes have many opportunities to compete and score more points. The top four males and the top three females in each region of the FWQ Tour qualify for the 2015 Freeride World Tour. This is more then just a competition; it’s a chance to go on tour with some of the best skiers in the world, around the world. For more information on rules and regulations check out the official ranking system. As the final day of the competition came to a close, there was no doubt that the skiers on the podium had earned their places. Kylie Sivell took first for the ladies, which is to no surprise as everyone cheered and chanted her name. Meredith Eades took home silver while Sophie Lechasseur brought home the bronze and Hazel Birnbaum and Alex Riedman closed up the podium with fourth and fifth. As the male athlete competitors were being announced there was a clear indication that George Rodney was a crowd favorite, throwing a laid out backy—Crystal Mountain lifted their ‘no inversion’ policy for just this competition—and earning fifth as a result. The podium was completed by Davis Souza in fourth, Randy Evans in third, Colby Vavolotis in second and Sean Richard in first. A special thanks to everyone involved, from those passing out hand and toe warmers, to the musicians in the ‘Live Show’ and all the support from friends and family cheering on the athletes, whether from inside a warm lodge or out in the cold. Mark your calendars for next year, because it’s only going to be better, bigger and more impressive.